Anthony Allen won two England caps in 2006 but since then the centre has struggled to command a place in the national setup, hindered by injury and poor form. Born in Hampshire, Allen joined Gloucester from Millfield School after appearing for England Under-18 and Under-19 teams. Besides Millfield, Allen also spent some time at the Harlequins academy under the guidance of Tony Russ and Colin Osborne. He went on to play almost of century of games in four years at Kingsholm but gained only one domestic success in the 2006 European Challenge Cup. Allen made the England team in the autumn of 2006 when partnering Jamie Noon against the All Blacks. That match ended in defeat and he only made one further appearance in the series, against Argentina. 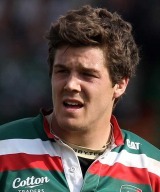 Allen then made the switch to Leicester and finished the 2009-10 season as first-choice in helping the Tigers to the Premiership title making 28 appearances for the Tigers. The success brought him a place in the England Saxons squad which won the Churchill Cup in the summer of 2010. Going into the 2011-12 season, Allen had the likes of Manu Tuilagi and Billy Twelvetrees to vie with for a spot in the centres but he was one of the standout players in the Premiership throughout the campaign. He did enough to impress England boss Stuart Lancaster and was included in the 42-man squad for their tour to South Africa. Allen's involvement was restricted to midweek uncapped matches but he did enough to impress Lancaster to be named in the EPS for 2012-13.